Sridevi has been one of the most popular Bollywood actresses of all time. Known as the first female superstar of the nation, she has done countless of movies in Hindi, Tamil, Telugu, Malayalam, and plenty of other languages. Though, her untimely demise on 24th February 2018 has certainly shocked the nation. Read on as we have come up with a detailed Sridevi biography and her best works. Born on 13th August 1963 in Tamil Nadu, Sridevi started her career way back in 1967 when she was only four. Kandan Karunai was her first movie in Tamil. After appearing as a child actress in plenty of Tamil movies, she had her first breakthrough in 1976. The movie, Moondru Mudichu was the first movie that featured Sridevi as a lead. After acting in countless of movies in the South, she got a huge break in Bollywood. The first Sridevi film in Hindi was Solva Sawan, which was released in 1979. She got noticed by other directors and was featured in blockbuster movies like Sadma, Chandni, Lamhe, Chalbaaz, Judaai, Gumrah, Mr. India, and more. After her marriage to Boney Kapoor in 1996, she took a break from movies. It was only in 2013 when she made a huge comeback with her hit movie, English Vinglish. Mom was Sridevi’s last movie as a lead, which was released in 2018. Sadly, she left us on 24th February 2018. Apart from getting numerous awards, she has also received a National Film Award and a Padma Shri in 2013. It was on 24th February 2018 when the news of Sridevi’s sudden demise shocked the world. Later, the news was confirmed by an official statement given by her husband, Boney Kapoor. She died in Dubai, UAE at the age of 54. Sridevi and her family went to Dubai to attend her nephew’s wedding. According to Boney Kapoor, Sridevi went to take a bath before having dinner with her family. Though, after waiting for a while, Kapoor got anxious. When he entered the bathroom, he found her being drowned in the bathtub. Later, it was discovered that the cause of death was a cardiac arrest. The cardiac arrest made her unconscious, which led to her drowning. After a few days of investigation, her body was released and a funeral was organized on 28th February. She was cremated with state honor and gun salutes. While she was cremated in Mumbai, her family later immersed her ashes near Rameshwaram in Tamil Nadu. Sridevi started her career at the age of 4 and has appeared in countless of movies so far. If you are a true fan, then you should not miss these movies for sure. Released in 2018, Mom was her last movie as a lead actor. Needless to say, the movie is special due to countless of reasons. She was also given a National Film Award for best actress for her performance in Mom. English Vinglish is one of the best works of Sridevi so far. Released in 2013, it embarked her official comeback as well. It was a coming of an age story of a housewife who decided to learn English and took an unforgettable journey in the process. Sadma was released in 1984 and has to be one of her best movies so far. It also included Kamal Hassan as a lead. It was the story of a young girl, who loses her memory after getting into a life-changing accident. Released in 1997, it was one of the last movies of Sridevi’s early career. It was a love-triangle that starred Anil Kapoor and Urmila Matondkar as leads, besides Sridevi. One of the most iconic love stories of all times, Chandni is a must-watch film for every movie buff out there. This romantic drama was released in 1989 and starred Rishi Kapoor and Vinod Khanna. Some of other movies are Ladla, Lamhe, Chalbaaz, Mr. India, Gumrah, Khuda Gawah, and Nagina. If you want to watch your favorite Sridevi movies and catch the latest news, then simply download Snaptube on your Android device. It is a freely available app that has integrated various video sharing platforms together. From timeless Bollywood movies to the latest news, you will find it all on Snaptube. Simply look for the film of your choice and watch it as per your convenience for free. Yes – it is really as simple as that. The app features a fast-loading player that supports HD streaming. 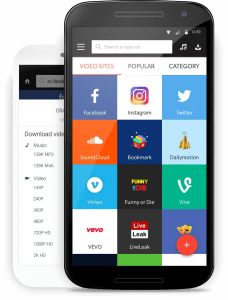 With an unlimited range of content, it is certainly a must-have Android app for every user out there.